Water, Dimethicone, Trisiloxane, Diethylhexyl 2, 6 Naphthalate, Glycerin, Potassium Cetyl Phosphate, Glyceryl Stearate, PEG 100 Stearate, Cetearyl Alcohol, Behenyl Alcohol, Caprylyl Methicone, Styrene/Acrylates Copolymer, Ethylhexl Glycerin, Benzyl Alcohol, Methylparaben, Cetearyl Glucoside, Xanthan Gum, Propylparaben, Disodium EDTA, BHT, Methylisothiazolinone. This is by far the best high spf moisturizer I have tried (and I have tried them all trust me...!) I use it when im on accutane so I dont get burned and it works, and what is just as important it dosn't clog my pores and cause whiteheads (wich is my biggest problem when finding a moisturizer with spf) Try it out! I read many reviews & searched high & low until I found a moisturizer that was oil-free, with spf & within my price range. I seen this & the raved reviews but kept passing it up looking for something better but all my searches led me back to this & glad it did. No breakouts, over drying nor odd scent to deal with. It's a very basic product but well worth the money. Best SPF moisturizer I've used. Effective as a moisturizer and a light sunscreen Doesn't cause oiliness or aggravate acne I've been using this moisturizer since last summer, and I've only needed one refill. I use it every day after I exfoliate. I much prefer SPF moisturizers, because I don't have to worry about sunscreen clogging my pores, looking greasy, or reacting with another product, and this is the best moisturizer I've found that's both oil-free and comes in such a high SPF. It's never made my acne worse or caused excessive oiliness. I'll never buy a different moisturizer :) Just remember that it is NOT a replacement for a strong sunscreen if you're going to be in direct sunlight. Light weight Non greasy None Been using it off and on and it never breaks out my skin. 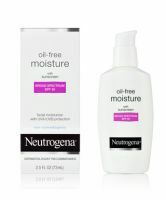 If I'm not using this I use DDF oil free for sensitive skin and I love that but it's a bit pricey. So this is a good alternative.